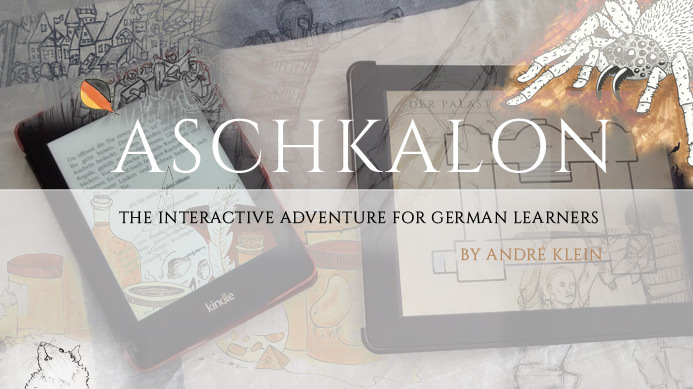 If you’re subscribed to our German ebooks newsletter, you might have heard about it already: our epic interactive fantasy trilogy for German learners is finally complete! To celebrate the completion of this trilogy which was two years in the making, the first episode, Genowrin, is now available as a free download for a limited time (offer expired) for everyone who’s interested. Read the story like any other book, until you reach an action point. There, you can decide what happens next. During battles and quests you’ll be asked questions. If you answer correctly, the story continues. Got it wrong and died? Just hit “back” and try again! And since this is all about learning new words, the more you repeat a scene, the better! In this video I show the book on an older non-touch Kindle device. Of course, the whole thing is even more fun when you load it onto your iPad, smartphone or a newer Kindle with touch-based input. Is this a good book for beginners? The story is aimed at intermediate and advanced learners, but if you use a dictionary on your Kindle, iPad or Android phone, even beginners will benefit from this unique German learning adventure. Need help with that? See here.